Barcelona star Lionel Messi is almost at the level of Diego Maradona but Pele is the greatest of all time, according to Brazil legend Zico. Messi is enjoying another wonderful season, having scored 15 times in as many games for the Catalan club in LaLiga. 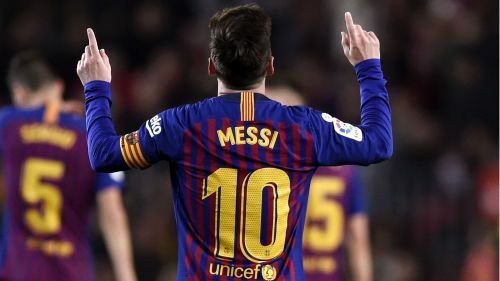 He is well on course to surpassing 30 goals in a single league season for an eighth time, while Barca are favourites to win the title and likely to be among the Champions League frontrunners. The Argentina forward has won everything with Barca and has a record-tying five Ballons d'Or to his name. Yet Zico – who starred for Brazil in the 1970s and 80s – thinks Messi is still not at the standard Maradona was in his heyday, while he ranks Pele above both because he had "everything". "Messi is close to Maradona," Zico, who works as a director at Kashima Antlers, told Omnisport. "That means, in my opinion, he can't be compared to Pele. I still consider Maradona in front of Messi. With Pele, no. Pele has all the qualities and characteristic that a football player has to have. "When God created him [Pele], he put every quality a footballer needs; speed, strength, impulse, technique, kicking ability, heading, dribbling – all of it, everything that a player might have. "Few people could jump like him for a header. He is 170 centimetres tall. His foundations are perfect, [he had] mastery of the ball, [and mastery of] headers. He improved in every way. Everything you can imagine from a player, Pele has done it." Zico accepts Messi does possess most of the qualities needed by the very best, though he feels a lack of success on the international stage is a big part of what sets Pele and Maradona apart from him. "[Messi has] almost everything, but he doesn't have the World Cup titles that Pele has. This [means] a lot," the Flamengo icon said. "Because, I think Maradona played, like in our period, with a player in his back all the time. Maradona has done a lot for his clubs, as Messi does, and for the Argentina national team. Maradona was a world champion. "Maradona has always stood out in the big competitions, and in a moment where Argentina was not a favourite with so many stars, like today, [when they have] high-level players in the big European teams. "I think he didn't play in a team like Messi plays in for Barcelona today. He didn't have a [Gerard] Pique, an [Andres] Iniesta, a [Luis] Suarez, a Xavi or a Neymar beside him like Messi has today."